Written in non-technical language, this book will help you make effective use of eBay to run your own home-based business and make money. You can operate either as a part-time or full-time business. It is written from a Canadian perspective and shows you how to get started with a very small investment. This book starts with an eBay primer and tells you what you can sell and how auctions work. It also shows you the role of eBay in the product cycle. You will learn about consignment selling and selling wholesale lots. Learn how to do your own research and decide on your offering price. It shows you how to present your product with special attention to the title, description, photos and scanned images. It covers software that will help you edit scanned images and photos. You will learn about the payment systems that are available and some of the factors you will need to address in delivering your products both domestically and internationally. Find out the importance of your "About Me" page and lean how to set up your own eBay Store. Find out how to keep your customers happy and get repeat business. Read about suggestions on resolving disputes with buyers. Learn how to choose the right computer hardware for your business how to calculate your Total Cost of Ownership (TCO). Take a look at the different operating systems and suites, as well as software to help you manage your eBay business. How to prepare your eBay business plan and some of the tax advantages of working from home. How to get help and learn more about eBay. 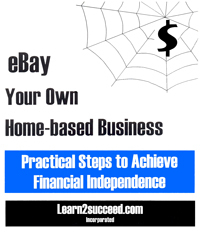 eBay Your Own Home-based Business: Practical Steps to Achieve Financial Independence by: Learn2succeed.com Incorporated; 182 pages, ISBN 978-1-55270-329-8 softcover, published in 2008; $29.95.